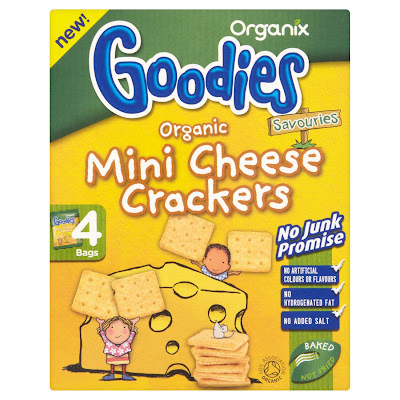 Organix launched their Goodies Mini Cheese Crackers in February this year and this month they become available in ASDA as well as Boots and Waitrose. Lara willingly volunteered to try out the new Organix Goodies snacks for the purposes of a review on Mellow Mummy! Lara can be quite reluctant when it comes to cheese or cheese products but she didn't hesitate for a second before devouring her first little snack pack of Organix Mini Cheese Crackers. In fact, after trying a bag myself, the entire box of crackers lasted less than 24 hours in our house because they were so popular. The Mini Cheese Crackers are a savoury snack made with rice flour and wheat flour and around 14% cheese. They come in small bags easy to put into a bag when you're out and about. The ingredients are largely organic with added Thiamin (vitamin B1) and they comply with Oranix's own 'No junk promise'. Lara loves these new snacks and I think they will become a family favourite. Have you ever hidden clothing from your child? Is Dry Shampoo Really A Mum's Saviour? What to pack in a hospital bag? Should My 2 Year Old Be More Cultured?